This Coalition has 65 women member organizations with multiple and variable experiences equitably distributed country-wide and has been playing an instrumental and pivotal role in promoting advocacy activities for women rights organizations towards raising awareness and soliciting support for women and men in public, as well as leadership, for inclusion of progressive women’s rights and gender equality principles in the new Constitution. The Coalition activities have been instrumental registering the achievement in the Proposed Constitution. 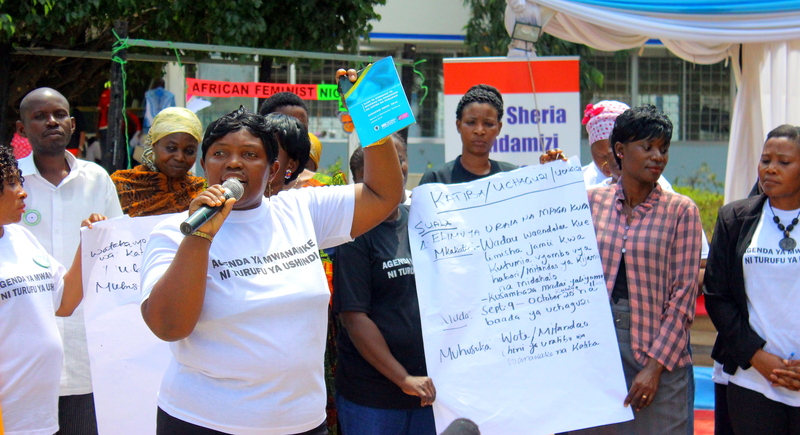 Women Fund Tanzania has also been instrumental in funding and enhancing the formation of Anti-Sexual Corruption Coalition, which has been functional since 2013. With the objective of raising a collective voice (through national campaign on “BREAK THE SILENCE: SEXTORTION KILLS”) on issues of sexual corruption at different levels, the Coalition has already engaged in key processes with growing results of enhanced conceptual clarity of Coalition members on issues of gender violence, sexuality rights of women and development and now looking forward to engage several government structures in dealing with anti-sextortion issues.